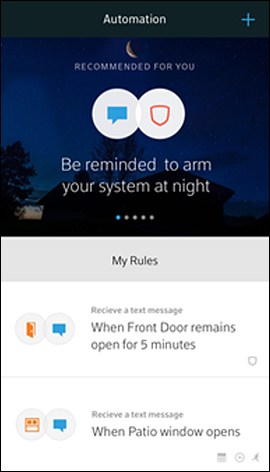 ANSWERED: What is the Xfinity Home App and how does it work? Learn how to use the XFINITY Home app for mobile devices to stay connected and control your XFINITY Home - Secure system. While the look and feel of the app varies depending on whether you have an Apple or Android device, the functions and features are the same. 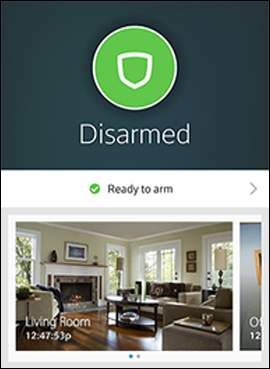 Don't Have XFINITY Home - Secure? Learn about the XFINITY Home app for mobile devices for XFINITY Home - Automation or XFINITY Internet. 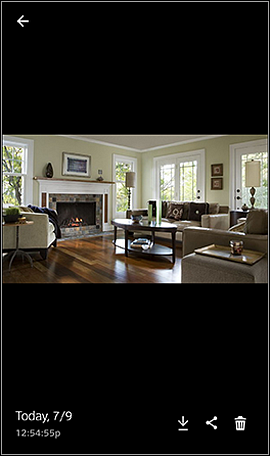 Sign in to the XFINITY Home app for mobile devices. 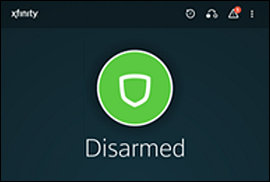 On Android devices, the top area of the Overview screen will show the armed status of your system and icons for navigating the app. Apple users will see the navigation icons at the bottom of the screen. Activity icon (clock) - View your system activity. Automation icon (two dots under an arrow) - View, add and manage rules. Change app settings and see information about the app. Sign out of the app. When you have system alerts, an Alerts icon (a triangle around an exclamation point) also appears in the top bar (on both Android and Apple devices). Tap the icon to view the alerts. Scroll down the Overview screen to see live video from your Camera, current information about your devices and recent system activity. 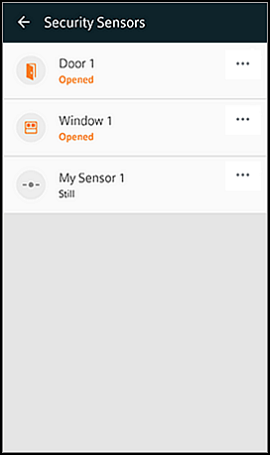 Scroll down the Overview screen and tap Zones & Sensors to view all of your Sensors, including Motion Sensors, Door/Window Sensors and Water Detectors. 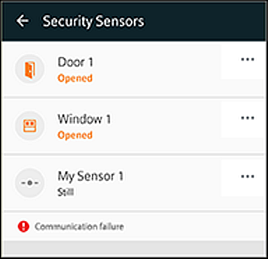 The Security Sensors screen shows you the status of each Sensor, such as whether a door or window is open or closed. 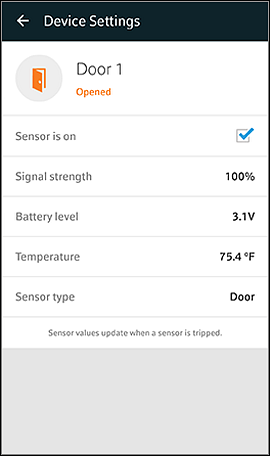 If there are any problems associated with a Sensor, you'll see an alert under it. Tap the Sensor name to see details for that Sensor. On the Device Settings screen, you can turn the Sensor on or off. If you turn off a Sensor, it won't trigger an alarm and no rules you have set up for the Sensor will run. Thumbnail images from your Cameras are displayed at the top of the Overview screen. Swipe left on the current Camera image to view other Cameras in your system. 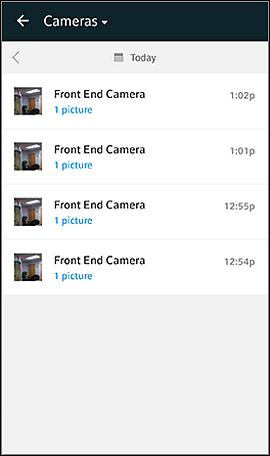 Tap a Camera image to manage the Camera. The Camera screen shows a live view from the Camera. If you don't have 24/7 Video Recording, you can tap Record Video to record a video, or tap Take Picture to take a picture. Don't See These Options? If you see a list of motion events under the Camera image, then 24/7 Video Recording is active for the Camera. 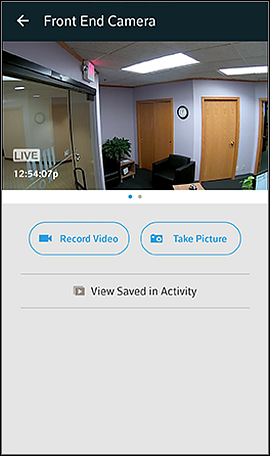 Get details on using the app to manage 24/7 Cameras. Tap View Saved in Activity to view your saved videos and pictures. On the Activity screen, tap All Activity to open the filter menu, then tap Cameras. Saved pictures and videos are organized by date and time, with the most recent picture or video at the top. Tap a picture to see a larger image or tap a video to view a recording. Tap the download icon (down arrow) to download the picture/video to your mobile device. Note: Videos and pictures are only saved in your account for 30 days. If you want to keep them longer, download them! Tap the share icon to share the picture/video with other people via text messaging or another app. Tap the trash icon to delete the picture/video. Did You Know? You can also manage your saved pictures and videos in your Subscriber Portal and in the XFINITY Home app for XFINITY X1. Rules help you to manage your system, saving you time and effort. They are incredibly flexible, customized commands that you use to automate your system, telling it what to do, at what times, on what days, and in response to what events. On the Overview screen, tap the Automation icon to see the rules that you've created for your system. Learn more about rules: what they are, what they can do for you, examples and more! Scenes let you control multiple devices with a single command. 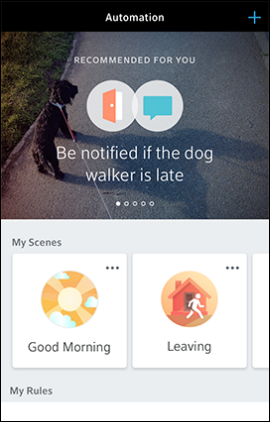 You can use scenes to organize tasks by time of day, such as Good Morning; by activity, such as Leaving; or however you choose! On the Overview screen, tap the Automation icon to see the scenes that you've created for your system. To learn more about scenes, what they are, and what they can do for you, read about Managing Scenes. 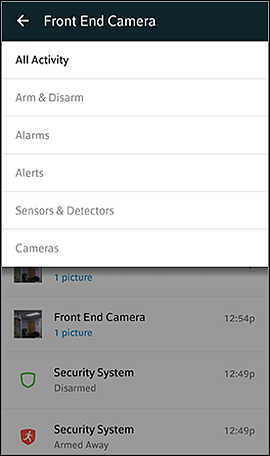 On the Overview screen, tap the Alerts icon to view your system alerts. The red circle on top of the icon indicates the current number of active system alerts. Try to resolve an alert as soon as possible. If you need more help, see the XFINITY Home Help & Support site for troubleshooting information or call 1-800-XFINITY. If you're using an Android device, tap the More icon (three vertical dots) at the top of the screen, then tap Sign Out. If you're using an Apple device, tap the More icon at the bottom of the screen, then tap Sign Out. Did You Know? You can sign out of all your XFINITY apps at https://login.comcast.net/logout.